What is a Contactless payment terminal? Home» FAQ » What is a Contactless payment terminal? The newest technology in credit card processing and merchant accounts are Contactless payment terminals, sometimes also known as tap and pay. This speeds up the check out process for consumers and retailers, and is becoming an increasingly popular form of payment. For Contactless payments, the credit card and the terminal interact through a smart chip known as RFID. that allows the payment to be processed without ever being swiped or manually entered. The smart chip transmits the information to the card reader and then the payment is processed just like any other credit card payment and merchant account. Contactless payments generally work the best for retailers who have quick transactions and want to speed up the check out process. It is also normally recommended for transactions under $25 since there is no signature, pin entry, or receipt. If you already have a POS credit card processing merchant account, it is easy to add Contactless payment options. 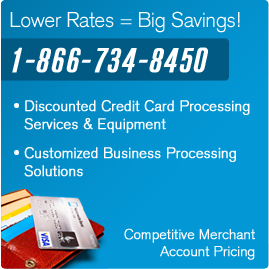 Call us at 1-866-734-8450 to learn more or sign up for a Contactless payment merchant account.